Is never silent round her sultry bloom. Seasonal pots have always been a pleasure to make. I like to paint what’s in the garden (or in our case on the roof) – so sometimes that’s daffodils or bluebells, sometimes courgettes. 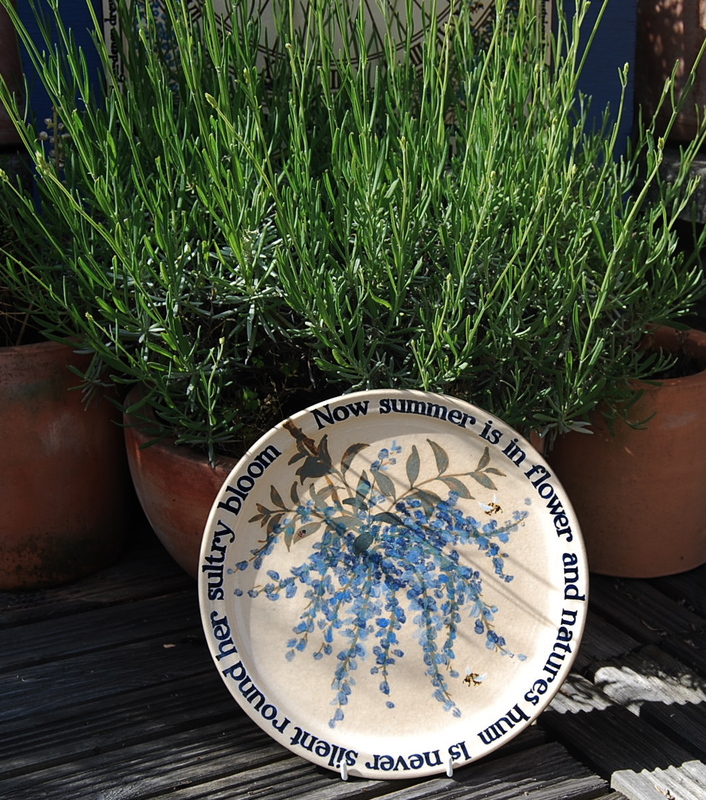 Now the rosemary flowers have just faded, but the strawberries are here, the sage is in full bloom, and the lavender hedge is just about to begin – we only have to wait just a little longer for that heady delight. This June plate was a birthday commission; I often use lines from John Clare’s Shepherds Calendar or his Midsummer Cushion for seasonal commissions – his ‘wildfield catalogue of flowers’ never fails to inspire. 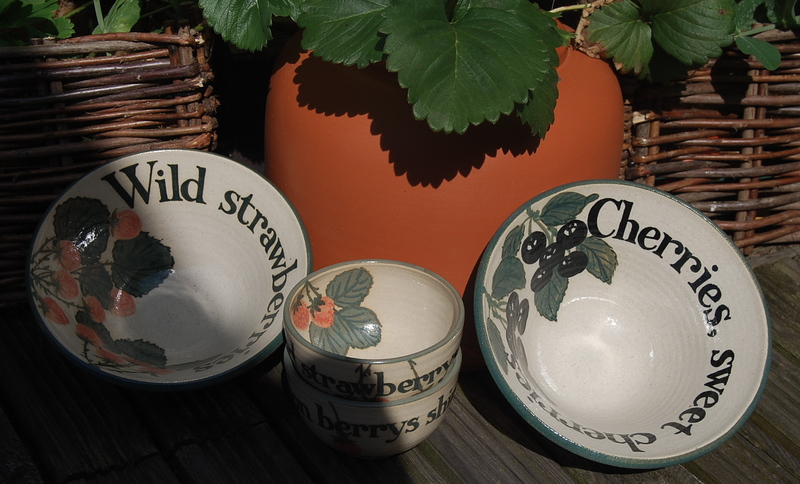 Also of the moment are strawberry bowls, cherry bowls and flower jars and jugs – just right for keeping the drinks cool in the garden (or on the roof). With an English summer you have to make the most of every sunny afternoon. And with a profusion of flowers everywhere (thanks to all that rain), the pots tend to get covered too (and the car). 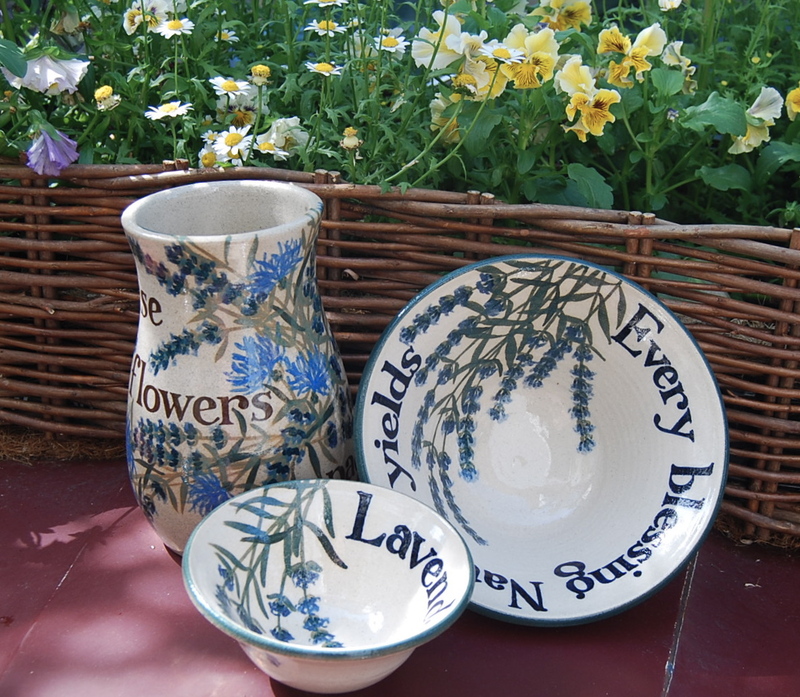 Summer pots for sale from the studio (each a signed one-off): strawberry bowl size from £60; little lavender bowl size £30; Joy and treasure plate (text by Burns) £120; flower jars from £80. To enquire about or buy any of these pots, please leave me a note in the comments box below or click here for contact details. This entry was posted on	June 17, 2010 at 4:50 pm	and is filed under Work in focus.